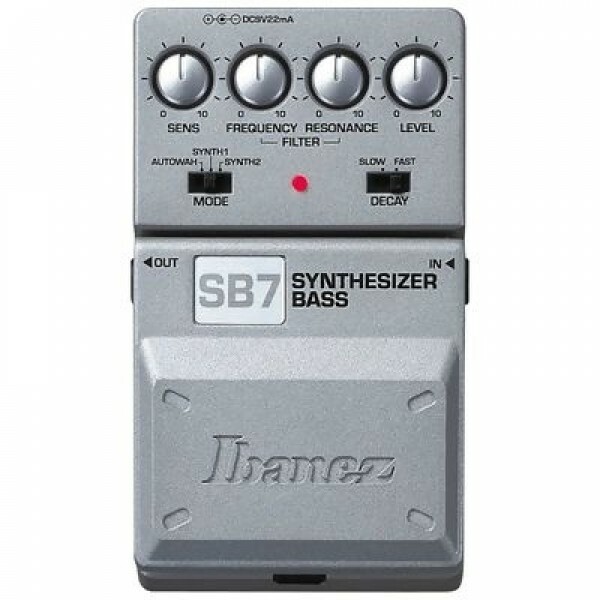 The Tone-Lok Series Ibanez SB7 is a synthesizer bass pedal that does its thing in real time”no drag, no tracking errors. You can even play chords. The SB7 bass pedal provides 3 modes: Auto Wah for that frequency-funky Shaft tone, Synth 1 for the light synth sound of '80s new wave, and Synth 2 for a deep, heavy Bootsy Collins-style funk bass sound. On the outside, Tone-Lok effects are equipped with the Ibanez exclusive "set and forget" Push-Lok rotary pots. Push the knobs down and your tone settings lock securely inside the case”no more lost settings or broken knobs. On the inside, Tone-Lok pedals feature hi-fidelity components carefully tweaked with the constant input from a new generation of Ibanez players. And all this great stuff comes encased in cool looking, road-tough metal boxes at prices the working player can afford.